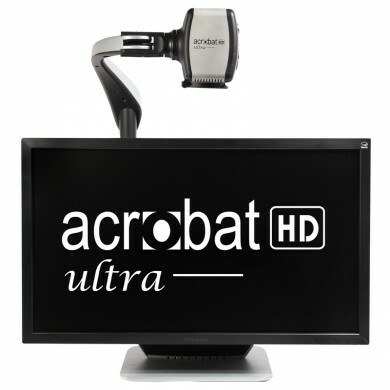 ​Acrobat HD ultra’s new Full HD 3-in-1 camera provides the best image quality available today! Enjoy brighter sharper colors and bold contrast with this feature rich electronic magnifier. A wider field of view allows you to see even more of what you want. By simply rotating the camera you can magnify images in the distance. Use it to view presentations, paperwork, even work on crafts and hobbies. Acrobat HD ultra is ideal for work, school or home, and is easily transported.